I have talked with other KPETS members over the years about our “disaster dogs”. Liberty passed her certification exam as a live human sent dog last weekend (Oct, 2013) in Ohio, and is now fully deploy-able as a FEMA dog (Urban Search and Rescue). We mourned the passing of Apollo, as any pet owner would grieve. However, his loss was a loss to the community as well. Apollo was a Urban Search and Rescue Dog – trained to find survivors in a disaster setting. He was active with the local fire department, Lancaster County Task Force 36 and PA-TF1 (FEMA). Liberty was on trained to carry on this work, but her first love was visiting people. With Liberty, and USAR, it seemed we had a failure to launch on our hands. When Apollo passed away, she got motivated. The certification process requires periodic testing – every three years, they recertify. The first test is the FSA (fundamental skills test). It requires the five minute down, directionals, and the emergency stop. The dog works off lead and must mingle in a figure eight around other dogs and handlers. NO aggression is tolerated, and sometimes the dogs are piled up on a pallet or a bench and must stay there calmly with the other dogs. The emergency stop involves calling the dog from a distance and then yelling STOP, and the dog must stop right there. The long down, involves ten minute stay. They cannot move more than 1 body length. Directionals involve an imaginary baseball diamond. The directionals start at home plate and the dogs are directed to 1st, 2nd, 3rd and the pitchers mound. This is of Abby at a large multi-county disaster drill. with the Hope AARCR dogs. It was a radiation Accident drill. The most difficult part of the test is the rubble pile. Dogs start learning to use their nose with barrel work. Several large barrels are lined up. There is a human in one barrel and when they sniff out the person, the lid pops open and a toy comes out and the dogs play. This translates to finding a scent in a pile of rubble. No food is allowed in testing. In fact in training a bag of fast food is left nearby and the dogs must leave it alone. Many people may remember the building that collapsed on a Good Will store last June. Liberty’s sister Phoenix was the dog who alerted on the live person. She barked for two hours until all the building materials were cleared away and the person was rescued. Liberty’s test involved finding five live victims on two different rubble piles within 20 minutes. Air currents can make this process more difficult. She does not track scent, she catches the scent in the air current and follows it. This work is not for everyone. It can be wet, dirty and gross. Generally, no heat or comfort. At Hurricane Katrina the Pa TF1 K9 teams slept on tires in a tire store. At super storm Sandy, they slept on a concrete floor. Utilities are generally off. No heat, water, or electricity. Sanitary facilities can involve a bucket, toilet seat and plastic bag. Yuck this is not for me. I did want Abby to get involved in disaster work. Abby is a Hope AACR dog. In the past there was a Hope AACR team in this area who promoted this as an organization for mental health professionals. This is not true. Our past president is an engineer. Our current Regional Director is a dog trainer. 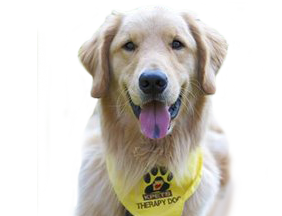 Good people with experienced therapy dogs are candidates for Hope AACR. Hope AACR dogs are certified working dogs, with the rights and responsibilities of certified working dogs. They may be tax deductible. They may fly in the cabin when traveling to an event. The certification process involves an assessment, and then a workshop. The assessment is similar to the KPETS’ evaluation with lights, sounds and chaos that might be found at a disaster scene. The workshop is three days of education involving the disaster scene, transportation drills and role playing at a disaster. Hope AACR teams do not self deploy. Requests go to Regional Director and teams deploy. The teams do not go during the disaster, but later during the recovery. Last year Hope teams went with the Salvation Army after Super-storm Sandy and comforted people during the FEMA paperwork process, and while Salvation Army distributed hot drinks and warm blankets. Hope AACR teams are trained in crisis response. These visits may be unpredictable as compared to therapy visits. However, when we visit our KPETS clients, think about it – most of these people may be in crisis. elderly person, moves out of home into a room or shared room in a facility. My job in healthcare does not allow me to take off and go to a disaster. Abby and I are members for Lancaster CISM (Critical Incident Stress Management). When first responders are exposed to a traumatic event, counselors and peers are sent to do a debriefing and defusing of the event. This is a counseling event. The dogs are present either before or after the counseling to help relax and calm the first responders involved. Again, Hope AACR teams do not do any mental health work. The dogs are comfort dogs. It always amazes me at CISM training. These big burly firemen or police officers come up and snuggle and pet my little poodle. We are also members of our fire department support group. If this group is sent to a lengthy fire call, Abby and I will go as well. These other organizations are in addition to our KPETS work. We still love our local visits. In fact, for Hope AACR 12 therapy visits per year is required. If any Kpets teams are interested in either organization, here is some additional information. Live Human Scent dog: Handler must train with PaTF1 K9 team for six months before starting a dog. Typically dogs are started at eight weeks of age, and must be 18 months old to take the FSA (1st test). Contact Amos amoose56@aol.com if interested in this. PaTF1 needs volunteer victims. The dogs get used to the same victims, and need variety. The team often trains at HACC. Hope AACR.org is contact for membership information. There will be two workshops next year. Indiana and Texas. There are only two teams left in the Mid-Atlantic area. Abby and one other dog, who is a senior dog (age 12+). I have made contact with CISM and CERT, but I cannot handle the requests for help alone.